At every race expo, these Power Crunch guys come out with their wafer-like energy bars cut up in small pieces for sampling. They even give you two full-sized bars to take home. I am not a big fan of these bars, but Tea Time is, and maybe she can write a review of them. However, these folks also have a "choklat" bar that is pretty darn good. They were giving them out after the LA Marathon, and although I would have eaten anything at the finish line, this even tasted good the next day. It's like eating a huge, thick Crunch Bar, except it has 10 grams of whey protein per serving. I believe the bar has 2 servings, making it about a 440 calorie bar. It even rips off in pieces the way other chocolate bars do. 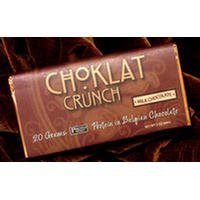 Choklat Crunch comes in Milk Chocolate and Dark Chocolate flavors. Oh yeah, these are excellent! Love them. They are so good!